On October 22 our staff participated in the Alzheimer’s Association Walk to End Alzheimer’s. 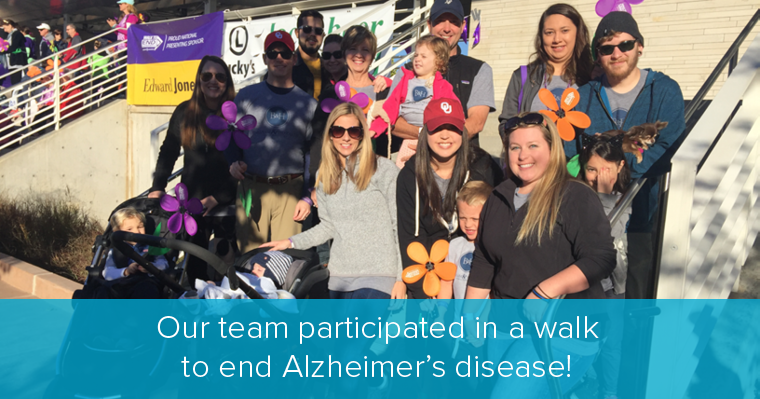 This Walk is particularly dear to our hearts because Alzheimer’s has affected our parents, grandparents, friends and other loved ones. We were honored to participate along with several thousand walkers at the Guthrie Green downtown. There was a sea of purple at the fundraiser listening to testimonies of loved ones caring for their family member suffering from Alzheimer’s. We were honored to participate along with several thousand walkers at the Guthrie Green downtown. There was a sea of purple at the fundraiser listening to testimonies of loved ones caring for their family member suffering from Alzheimer’s. The Alzheimer’s Association Walk to End Alzheimer’s is the world’s largest event to raise awareness and funds for Alzheimer’s care, support and research. This inspiring event calls on participants of all ages and abilities to help fight to find a cure. Right now, more than 5-million Americans are living with Alzheimer’s.